Saudi Telecommunication Company’s CEO, Saud Dowaish announced that the iPhone 4 will be available from STC on February 11th. The iPhone 4 from STC was delayed for several months. FaceTime will not be enabled on STC issued iPhone 4 units. â€¢ Initial payment for iPhone 3GS 8GB: free. â€¢ Initial payment for iPhone 4 16GB: free. We are now waiting for the actual release of the iPhone 4 and Apple updating their Saudi Arabia website. any connection between Mobily first release of iPhone 3G in Feb 2009, and STC release of iPhone 4 on February 2011, ..
Is it going to be unlocked? I want to know that if the iPhone 4 released by mobily has facetime feature enabled or not ?and is iPhone 4 still available on mobily stores in jeddah? is iphone 4 still available on mobily stores riyadh? I think yes there is a connection between the two dates. I heard from someone inside STC that mobily had an exclusivity agreement for the iPhone till Jan 2011; meaning 2 years. But.. if there be enough stock for us? or will go all to black market like Mobily? I just want to know will the iphone 4 be locked if we get it from STC ? Dear Driends the iphone from Stc and mobily is factory unlocked phones. Dear DaKing it is Confirm from Apple that the iphone of STC is Unlocked. Hope will get it from STC now…but I want to know where can I purchase it online in Jeddah? If anbody could help me please. Dear Ahmad I hope u get Iphone from STC. U can go 11 Feb in Falstien Branch of STC.And Inshallah Got Iphone. 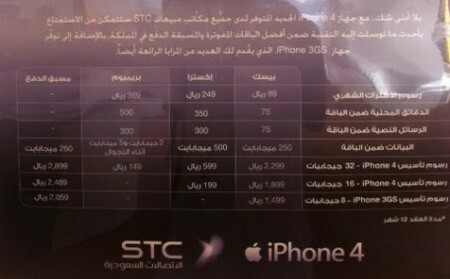 I want to know that iPhone from STC will be launched in which branches of Jeddah? Also please let me know will it be available in ladies branch of Jeddah? Dear Saud. Ithink it is avalibale in Phalasteen St. Ladies Branch. Still its not been updated on STC on Apple website. Any ideas ?. hi guys, i will be coming for visit to saudi arabia in late faburay. any idea that i cn buy this phone from STC? if not than from outside but in what price? i call 902 STC and he said me the iphone is lunch on Sunday 13 February. any updates whether its releasing or not? Is the iphone 4 sold by mobily facetime enabled??? thanks for the reply vicky, I hope this time I could buy it from STC, its so hard to buiy in mobily, they are like airport staff, the way they treat ppl. Could facetime be available on upcoming software updates? any info, if you can buy iphone 4 at STC today? and what brach? im waiting for comments before i go to stc today! FIRST: All iphones sold in saudi arabia by mobily and STC are factory unlocked. But before you decide to buy today or tommorow or on any other day, Ask yourself this, are you willing to buy an iphone4 without FACETIME? Yes jailbreaking sounds an answer, but its not stable. All IPHONES with model numbers ending with AE and AB, which means all gulf countries have ni FACETIME feature! You cannot enable it even if you go out of saudi arabia or any other gulf country. So if anyone decides to buy today ask the seller first if FACETIME is available, most probably not and if they are willing to enable it in the future. so iphone4 id available now in STC?? what branch?? Please anybody confirm that iphone 4 is launched today at STC or not? I think Tomroww Lunch on Sunday. hi anyone here has kind of soul who can tell me if which is more cheaper iphone 4 price from Jarir Bookstore or from stc/mobily?? i read from jarir magazine their iPhone4 has facetime can anyone here please confirm for me? and may i know also if all iphone4 sold on jarir is unlockable or not?TIA!